The film begins with a scene from a police station where the police officer Sasi in charge orders that the documented criminal cases in the form of manuscripts be converted into digital format. During this process he comes across a really spine chilling dacoity murder case from several years ago. 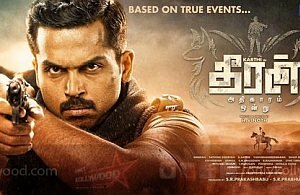 After reading the case history he calls up the police officer who had taken charge of the case, Theeran Thirumaran (Karthi). The story shifts to the year of 1995, where Theeran is in his police training college undergoing training to be posted as DSP from TNPSC (Tamil Nadu Public Service Commission) exams. He tops the training period. Simultaneously in a house along the highway of Tamil Nadu a group of dacoits wreck the house by barging in killing all the people inside gruesomely and taking the belongings.